‘Cauld blew the bitter biting North’ may be a line from one of Robert Burns’s best-loved poems and it certainly applied last week along with the accompanying sleet and hail showers. Diners sitting in the comfort of the conservatory restaurant at Lochter, which overlooks the Osprey and Heron Lochs, while tucking into the fine cuisine are often heard to make remarks like ‘They must be mad’ as they view the sight of a solitary angler, back to the wind, casting their chosen flies optimistically into the choppy unrepentant water seemingly devoid of both fish and fly life. However there are two sides to the story and this supposedly lovely chap is very content with this lot. He knows that these diners don’t understand that he is dedicated to his sport, having freed himself from domestic drudgery and such things as the weather are a mere aside. He is out in the fresh air, in the countryside he loves and is free of lifes hassles for as long as his fishing ticket allows. He has noticed that there is a squadron of swifts still vigorously patrolling the waves feeding an emerging fly life even in the face of its unseasonal squalls. 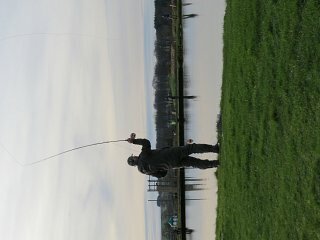 The fish will still be feeding and his goal, like all anglers is simply to catch them. Indeed, during the week the fish continued to feed and for your weekly ‘Blobby Boys’ update – Doug Mair and Billy Ferries coaxed 24 fish between them usual Diawl Bachs, Buzzers and the Mop Fly. Arnold Herba netted 20 fish using different colours of Wotsit during his session and Alan Ross also used the Wotsit along with the Buzzers to account for 17 fish. James West stuck to the tried and tested WSW Lures which proved very effective as he landed 15 fish for his session. Steve Urwin, down from Morayshire for the day, described his day as ‘Brill” after he netted 14 fish on a variety of Buzzers. Keith Wright cast his spell over the fish when he described his day as ‘Magic’ but in reality it was all down to his skill in using the Bloodworm. Brian Hay landed 10 fish on Bloodworm, Ron Phillips also had 10 on Black Buzzers and Mini Lures and Pete Young enjoyed his day ending with 8 fish caught on a variety of Lures. Hopefully with the weather for the coming weeks being more in line with the seasonal norm anglers may start to cast their eye towards the dry fly section of their fly box in the hope of that perfect rise.